Happy November! While it will no doubt be over by the time this post goes live (I’m typing it up a week in advance), we’re even having a very appropriate spell of warm weather right now: sunny, with highs in the 70s (F; over 20° C). Alternately: “Indian summer.” A warm day with nice weather in late fall or early winter. Notes: Apparently koharu was an old term for the tenth month of the old lunar calendar; around November by the modern solar-year reckoning. Hiyori (voiced as biyori in the compound) is simply good weather. “Koharu” is also a girls’ name. So it’s like “April,” “May,” or “June” in English, kind of, except instead of a spring name, it’s the last warm breath of fall. 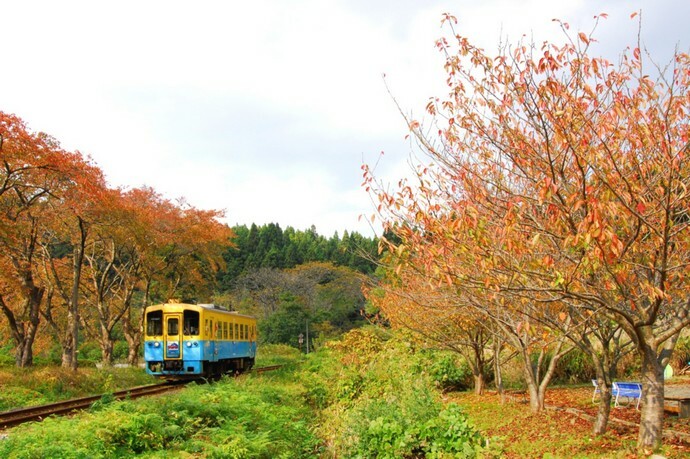 With the brightly-colored one-car train, this shot just SCREAMS “rural Japan” at me. Source. This entry was posted in Japanese, Yojijukugo and tagged Indian summer, November, warm autumn, 小春, 日和. Bookmark the permalink.